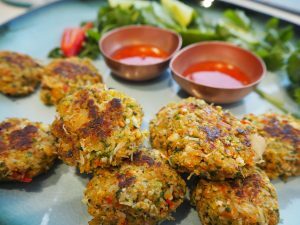 My mini Asian-inspired gluten free crab cakes are a perfect festive canape. 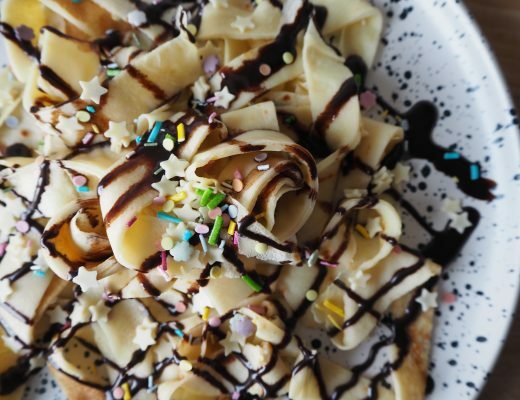 Flecked with green and red and golden on the outside, some simple presentation turns them into a real party favourite. 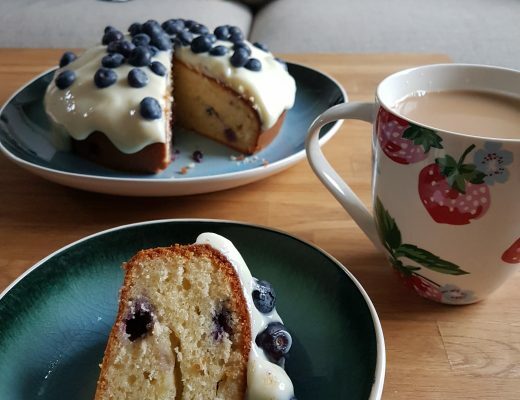 Simple to make and one you can prepare in advance, I know I will be making these a number of times in the run up to Christmas. These gluten free crab cakes also make for a brilliant starter dish, served with fresh avocado and sweet chilli drizzle, the best way to kick off your festive feast. 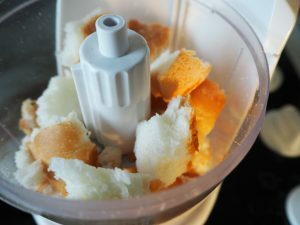 Tear the gluten free bread into small chunks and blitz in a blender until you have fine breadcrumbs. 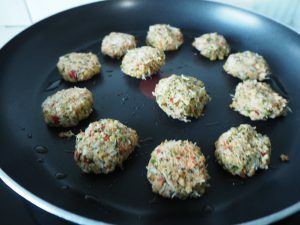 Any gluten free bread is good for these gluten free crab cakes and you can also use stale bread or leftovers rather than opening a fresh loaf, if needed. I use white bread in mine, but brown or fibre bread would also work perfectly well. 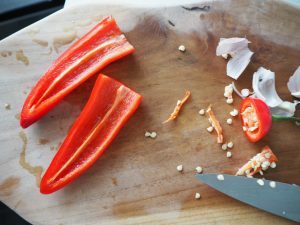 Add the fresh chilli (deseeded, unless you like it hot, and chopped into rough chunks), a handful of fresh coriander and two garlic cloves to the blender and whizz. 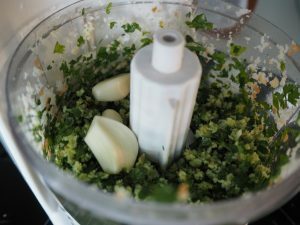 You might have to transfer some breadcrumbs out if you have a mini chopper blender like me, but once the coriander has blitzed down you can add these back to the blender for a final mix. 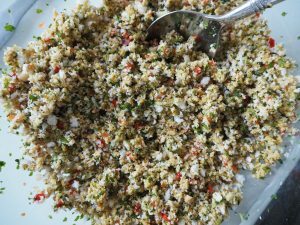 Transfer the contents of the blender to a large bowl and give a final stir to make sure everything is well mixed, adding a pinch of sea salt flakes and a grinding of fresh black pepper. The mix is starting to zing with flecks of spicy chilli and fragrant coriander by this point – mmm! 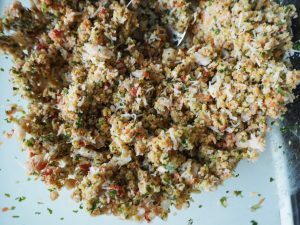 Add the crab meat to your mix and stir through to combine, breaking up any large chunks of crab meat. The crab is stirred in by hand as a blender would just puree it and you would miss out on those lovely pieces of fresh crab. 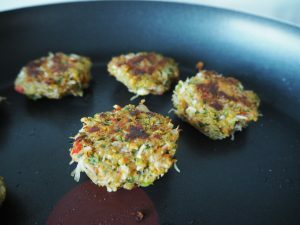 You can use white crab meat only for a slightly milder flavour, but a mix of white and brown stands up well to the strength of the other flavourings in these gluten free crab cakes. Now take a frying pan and heat a little olive oil over a medium heat. A heaped teaspoon of mix is enough to make one mini gluten free crab cake. Scoop and then gently shape with your hands into little patties, popping each straight into the frying pan. Cook the gluten free crab cakes for approx 5 minutes on each side. 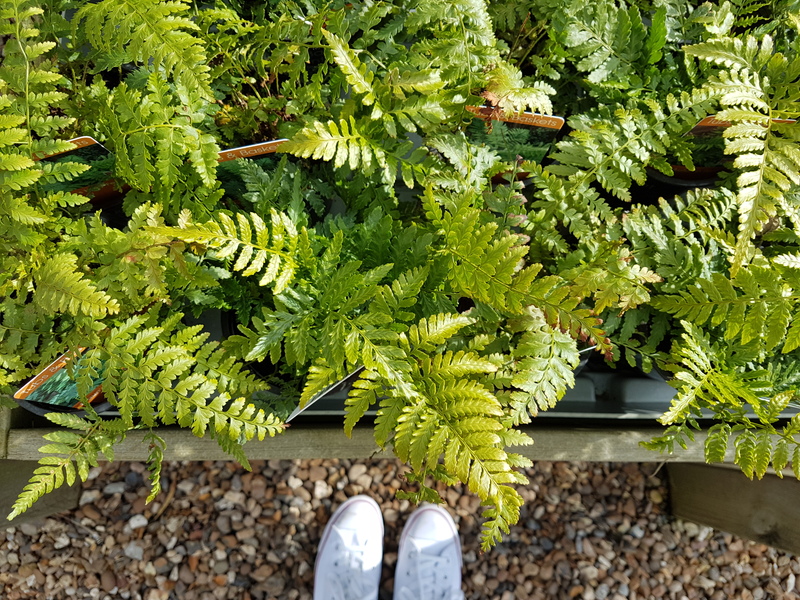 They take on a beautiful golden colouring on the outside and are warmed through. You can either serve them straight away or set aside for later and then rewarm in the oven (180C, 10 minutes). 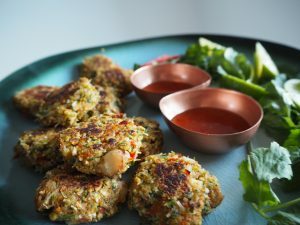 To serve these gluten free crab cakes as a canape, have them with a sweet chilli dipping sauce and chunks of lime for squeezing. 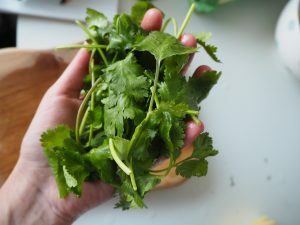 Adding some fresh coriander or salad leaves to the plate gives pretty presentation. 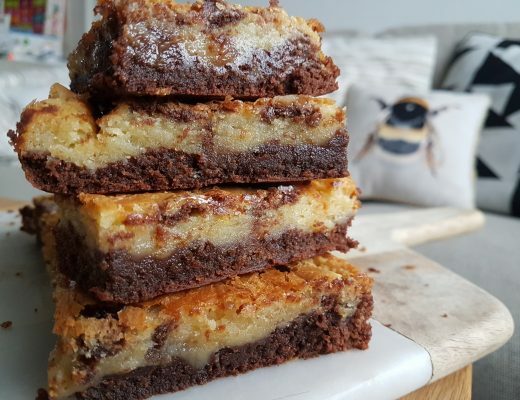 For a simple midweek meal, they are beautiful with an avocado salad and a drizzle of sweet chilli.